Exabyte - 307265 EXABYTE/TANDBERG - 8MM D8 160 METER 7/14GB TAPE CARTRIDGE (307265). NEW. MINIMUM ORDER 10 PCS.IN STOCK. SHIP SAME DAY. Exabyte - 309258 EXABYTE/TANDBERG - 8MM D8 DATA CLEANING CARTRIDGE 18 PASS(309258). NEW. IN STOCK. MINIMUM ORDER 10 PCS. SHIP SAME DAY. Exabyte - 11100200 EXABYTE/TANDBERG - VXA 8MM 62 METER 20/40GB X6 DRIVE TAPE CARTRIDGE (11100200). NEW. MINIMUM ORDER 10 PCS. IN STOCK. SHIP SAME DAY. Exabyte - 11100100 EXABYTE/TANDBERG - 8MM 12/24GB 62 METER VXA V6 TAPE CARTRIDGE (11100100). NEW. IN STOCK. MINIMUM ORDER 10 PCS. SHIP SAME DAY. 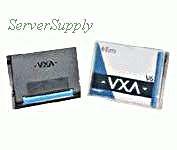 Exabyte - 11100206 EXABYTE/TANDBERG - VXA 8MM 124 METER 40/80GB X10 DRIVE TAPE CARTRIDGE (11100206). NEW. MINIMUM ORDER 10 PCS. IN STOCK.SHIP IN SAME DAY. 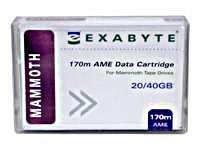 Exabyte - 11100103 EXABYTE/TANDBREG - V17 8MM 170M 33/66GB OR 60/120GB TAPE CARTRIDGE (11100103). NEW. MINIMUM ORDER 10 PCS. IN STOCK. SHIP SAME DAY.